PAX 08: Hands on with Sam and Max Season One ... for the Wii, OMG! 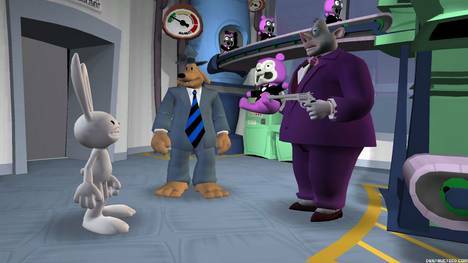 After its PC debut on Gametap nearly two years ago, the entirety of Sam and Max Season One will be making its way to the Wii this fall. And considering the game has been rumored to be coming to Nintendo’s console for just as long, I’d imagine many fans are breathing sighs of relief. Developer Telltale Games had a playable and final version of the Wii software on hand at this year’s Penny Arcade Expo, and once I got the Wii remote in my hands, I discovered one thing: it’s definitely Sam and Max Season One. That is to say that not too much has changed, and that's a good thing. This is, after all, a port of their award-winning point-and-click adventure. All six episodes will be making their way to the Wii in one retail package, with everything intact; beyond some game-supplementing extras like bonus artwork, there may not be much for players who have already experienced the wacky adventures of the crime-solving dog and bunny duo. 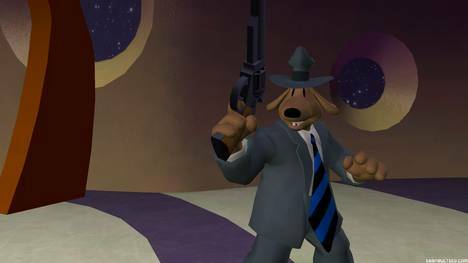 But for those looking for the Sam and Max experience on your couch, Sam and Max Season One on the Wii looks like it’ll scratch that itch. More after the jump. Playing the Wii version of the title you’ll only be using the remote, pointing at and clicking (with the A button) various objects in the environment with a paw pointer, similar to that seen in the classic, Sam and Max Hit The Road. It’s fairly simple, works well with the Wii remote, and really doesn’t feel much different than the PC version which only utilized the mouse. Some tweaks have been made to the controls, like the ability to hold down A and move the point to have Sam follow it, or double tapping it to make him run. The cardboard box icon in the corner of the screen remains and can be opened by interacting with it, but you’re also able to tap the minus button and then scroll through your items with the d-pad. I found myself gravitating towards clicking on the box, only because I was used to it from playing the PC games; it seems the minus/d-pad combo is a quicker, more efficient way for item selection. Visually, the game doesn’t look quite as sharp as it would on some high-end (and maybe even some "low-end") PCs, but it doesn’t look awful running on the Wii; Telltale’s quirky style and visual comedy still comes through. It should also be noted that the game will support widescreen mode, something that the PC version of Season One did not. I did notice some slight frame rate issues while moving about the environment, which was troubling considering the version that was available to play was final code, recently submitted to Nintendo for approval. Considering the game isn’t entirely about twitch action, this really isn’t a huge issue, but it’s definitely something to note. Curious, I asked Telltale’s Emily Morganti why they made the decision to bring Sam and Max Season One to retail rather than deliver it episodically to WiiWare. She notes that it would be possible to bring to the episodes to WiiWare, but with another episodic title of theirs, Strongbad’s Cool Game for Attractive People, already available, they want to bring something to the retail space. Additionally, she likens it to a television series coming to DVD; using The Sopranos as a reference, she questions how many people were watching single episodes on re-reruns, rather than simply picking up the DVDs and watching them as a whole. Many personal nights (and full weekends) of plowing through television show seasons I missed makes her point seem pretty valid. There’s no release date set in stone, but with the game about to ship off to Nintendo for final approval, it should be within the next few months. 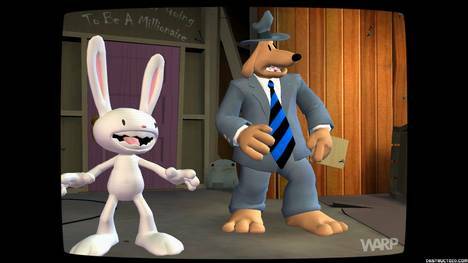 It’s likely we’ll be seeing Sam and Max Seasons One come to the Wii in October or November of this year.